THE character of the people before the flood as given by the unerring pen of inspiration is explicit. And God said, "My Spirit shall not always strive with man for that he also is flesh. And God saw that the wickedness of man was great in the earth, and that every imagination of the thoughts of his heart was only evil continually. And it repented the Lord that he had made man on the earth, and it grieved him at his heart. The earth also was corrupt before God, and the earth was filled with violence. And God looked upon the earth, and behold it was corrupt; for all flesh had corrupted his way upon the earth." Here the faithful historian with an inspired pen draws the portrait of Noah's day, when we are told that the heart of man was deceitful above all things and desperately wicked. The nature of man unrenewed by grace is not changed in our day from what it was in Noah's time. Christ has said a similar state of things would be prior to his second coming as existed before the flood. In the days of Noah men followed the imagination of their own hearts, and the result was unrestrained crime and wickedness. The same state of things will exist in this age of the world. But will not some of the learned, the honored of the world, accept the message of warning in these last days? Will the world as a majority perish in the general impending ruin? How was it in Noah's day? as it was then Christ has said it should be. Of that vast population there was only eight persons who believed the message of Noah and obeyed God's word. In the world to day the majority choose the broad road to death because the way of life is too narrow for them to walk in with their dishonesty, avarice, pride and iniquity. Now, as in the days of Noah, the overwhelming majority are opposed to the saving truth and are fascinated with lying fables. Many now are convicted, and God's Spirit is striving with them, but they will not heed the invitations of mercy. Men who make high profession of wisdom and of godliness transgress the law of God without compunctions of conscience. One marked feature of Noah's day was the intense worldliness of the inhabitants. They were eating and drinking, planting and building, marrying and giving in marriage, not that these things were of themselves sins, but they were, although lawful in themselves, carried to a high degree of intemperance. The appetite was indulged at the expense of health and reason. This constant indulgence of their sinful desires corrupted them and defiled the earth under them. The same evils intensified exist in our world to day. Men are blind to reason and the result of indulging perverted appetite. The world is the god of nine tenths of professed Christians. The indulgence of appetite is carried to the greatest excess. Tobacco, wine, liquor and drugs are added to the list of a feverish stimulating diet. Professed followers of Christ are today eating and drinking with the drunken while their names stand in honored church records. The gratification of perverted appetite leads directly to the indulgence of unholy passions. Many feel under no moral obligation to curb the appetite or the base passions. They are slaves to perverted appetite. They are not living for the future life. They are rushing on as did the inhabitants of the world in Noah's day, living for this present existing world regardless that their deeds of the present every day life casts its shadow forward in the future, and the retribution will be in accordance with their works. They are as disobedient today in reference to God's laws as they were in Noah's time. While in the world they will not keep separate from its pollutions but will be of the world, notwithstanding God has expressly forbidden this union with the world. As in Noah's day, philosophers and men of science see nature's laws but cannot carry their wisdom higher and see beyond these laws nature's Lawgiver. Wise worldly men seek to practically reason out or theorize in regard to nature without taking the God of nature into the account. Many will resist God's warnings and array themselves against his law because their sinful life cannot harmonize with the pure principles of God's moral government. They consider it too hard work to reform their lives, therefore they endeavor to make the law of God meet their low standard of morals. It was God's purpose in sending Noah to warn the world that the people should see their sins and awaken to a sense of their crimes and great wickedness and be alarmed and fear and repent that God might pardon and save them. As the time of Christ's second appearing draws near, the Lord sends his servants with a warning message to the world to prepare for that great event. As the world have been living in transgression of the law of God, in mercy he sends a message of warning to arouse their attention and hold before them the law of God as a mirror into which they can look and discover the defects in their moral character. If they will at once make earnest efforts to remedy these defects, by repentance toward God and faith toward our Lord Jesus Christ, they will be pardoned through the merits of his blood, for this is the only hope of the transgressor of the law of God. But as in the days of Noah, there is with the majority a total disbelief of the testimony God has in mercy sent to warn the world of her coming destruction. When Noah proclaimed the solemn message, yet an hundred and twenty years the judgments of God in a flood of water should destroy the world and its inhabitants, men would not receive it, so it is at the present time. Those who warn the transgressors of law to repent and turn to their allegiance for the Lawgiver is coming to punish the disobedient, will plead and entreat and warn the majority in vain. Peter describes the attitude of the world in reference to the last message: "There shall come in the last days scoffers, walking after their own lusts and saying, Where is the promise of his coming? for since the fathers fell asleep all things continue as they were from the beginning of the creation. For this they willingly are ignorant of, that by the word of God the heavens were of old, and the earth standing out of the water and in the water; whereby the world that then was, being overflowed with water, perished; but the heavens and the earth, which are now, by the same word are kept in store, reserved unto fire against the day of judgment and perdition of ungodly men. But beloved, be not ignorant of this one thing, that one day is with the Lord as a thousand years, and a thousand years as one day. The Lord is not slack concerning his promise, as some men count slackness; but is longsuffering to us, not willing that any should perish, but that all should come to repentance. But the day of the Lord will come as a thief in the night; in the which the heavens shall pass away with a great noise, and the elements shall melt with fervent heat, the earth also and the works that are therein shall be burned up." The men of Noah's time, in their philosophy and worldly wisdom, thought God could not destroy the world with a flood, for the waters of the ocean could not be sufficient for this. But God made the philosophy and science of men foolishness when the time had fully come to execute his word. The inspired pen describes the earth as standing out of the water and in the water. God had his weapons concealed in the bowels of the earth to compass her destruction. And when the great men and the wise men had reasoned before the world of the impossibility of its destruction by water, and the fears of the people were quieted, and all regarded Noah's prophecy as the veriest delusion, and looked upon Noah as a crazy fanatic, God's time had come. He hid Noah and his family in the ark, and the rain began to descend, slowly at first; the jeers and scoffings did not cease for a time, but soon the waters from heaven united with the waters of the great deep; the waters under the earth burst through the earth's surface, and the windows of heaven were opened, and man with all his philosophy and so called science, finds that he had not been able in his worldly wisdom to comprehend God. He found too late that his wisdom was foolishness; that the Lawgiver is greater than the laws of nature. The hand of omnipotence is at no loss for ways and means to accomplish his purposes. He could reach into the bowels of the earth and call forth his weapons, waters there concealed, to aid in the destruction of the corrupt inhabitants of the old world. But let us all bear in mind that those who perished in that awful judgment had an offer of escape. 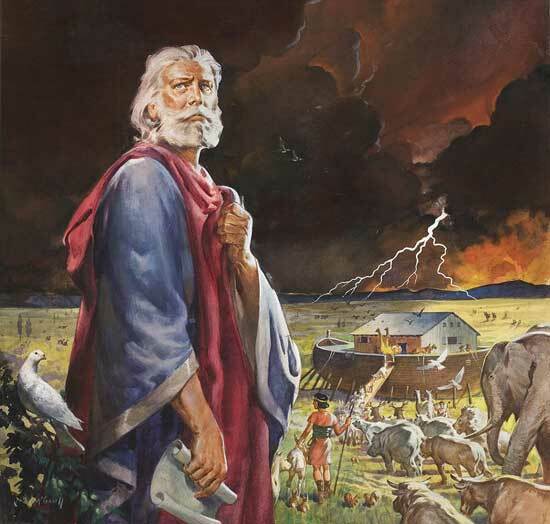 The faithful Noah had spoken to them the words of God, assuring them if they would repent of their sins and believe the testimony of warning they might find a shelter in the ark and be saved from the destructive storm that was soon coming. As it was in the days of Noah so shall it be also in the days of the Son of man. Water will never destroy the earth again, but the weapons of God are concealed in the bowels of the earth which he will draw forth to unite with the fire from heaven to accomplish his purpose in the destruction of all those who would not receive the message of warning and purify their souls in obeying the truth and being obedient to the laws of God. The voice of warning is now being heard inviting the people to escape and find refuge, not in the ark but in Jesus Christ. How will the warning be treated? Christ tells us just as it was received in the days of Noah. Thousands will deride the message of mercy and salvation, and turn aside, one to his merchandise, another to his farm, and give little or no attention to these things. They will be occupied with eating, drinking, and dressing, planting and building as in the days of Noah, as though no sound of alarm had ever saluted their ears. The same reasoning will be heard today from worldly wise men, from the unfaithful watchmen in the pulpits, "My Lord delayeth his coming, all things remain as they were from the beginning. You have no need to be alarmed, there is to be a thousand years of temporal millennium before Christ will come. All the world will be converted. Peace, peace; you should pay no regard to these fanatics, who are only alarmists." The world generally will despise prophecy and abuse those who speak to them the words of God, rebuking their sins and calling them to repentance. Timothy writes: "This know also, that in the last days perilous times shall come. For men shall be lovers of their own selves, covetous, boasters, proud, blasphemers, disobedient to parents, unthankful, unholy, without natural affection, truce breakers, false accusers, incontinent, fierce, despisers of those that are good, traitors, heady, highminded, lovers of pleasure more than lovers of God; having a form of godliness but denying the power thereof. What a picture is here drawn by the apostle in regard to the days, just prior to the coming of the Son of man." The millennial glory that is predicted by the false shepherds of today does not harmonize with the words of the inspired apostle. The question is asked, When the Son of man cometh shall he find faith on the earth? The deceived shepherds, deceiving their flocks in their turn, are the ones whose voices are heard prophesying the conversion of the world crying peace, and safety. The inspired apostle assures us we may look for wickedness to be continually increasing as the end approaches. The description given by Timothy of the sins to be found among those who have a form of godliness is sufficient to place the students of the Bible on their guard that they be not deceived in regard to the true state of things in our world by the syren songs of the sleepy shepherds crying peace and safety when destruction is just ready to burst upon the world. While Satan is working to quiet the fears and consciences of men, he is making his last master stroke to retain his power over a world which he sees is about to pass from his grasp--He has come down in great power working with all deceivableness of unrighteousness in them that perish. His lying wonders will deceive many. Philosophers and men of science will endeavor by their reasoning to show that the world cannot be destroyed by fire. They will plead that it is inconsistent with the laws of nature. But the God of nature, the maker and controller of nature, can use the works of his own hands to serve his purpose. Those who would be loyal to the God of heaven will not allow that interpretation of prophecy which will do away the force of the lesson God designed the prophecy should convey. As the contemporaries of Noah laughed to scorn that which they termed fear and superstition in the preacher of righteousness, so will the solemn messages of warning be ridiculed in our day. The Signs of the Times - January 3, 1878.